Dr. Bethany K. Kunz sets up a mobile-mounted dust meter, which measures concentrations of particulate matter across a range of particle sizes. 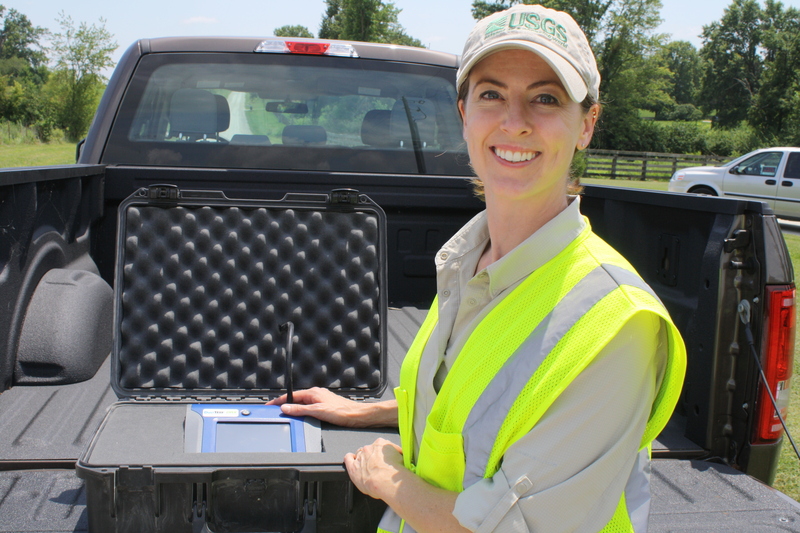 She and her team use the meter to determine the effectiveness of dust control treatments on roads and estimate human exposure to dust in the inhalable size range. Photo Credit: Christina Mackey, USGS. Dr. Bethany Kunz received the 2017 Environmental Excellence Award from the Federal Highway Administration (FHWA) for her exemplary research to advance knowledge of the effects of transportation on the natural environment. Since 1995, the FHWA's Environmental Excellence Award (EEA) recognizes outstanding partners, projects, and processes that excel in meeting growing transportation needs while contributing to stewardship of the environment. Dr. Kunz received the 2017 EEA from the FHWA for her research on the toxicity of dust control products used on our Nation's roads, and the potential impacts of those products on roadside organisms, soil chemistry, and water chemistry. Dusty conditions prior to road treatment on the auto tour loop at Loess Bluffs National Wildlife Refuge (formerly Squaw Creek NWR) in July of 2014. Loess Bluffs was the site of a large-scale field test of two dust suppressant products, with monitoring of product performance and environmental safety. Photo Credit: Bethany K. Kunz, USGS. The FHWA provides stewardship over the construction, maintenance and preservation of the Nation's highways, bridges and tunnels. Unpaved roads make up nearly 50 percent of the Nation's road network and more than 80 percent of the roads managed by Federal agencies. Dust from these roads has the potential to effect the health of nearby communities, damage roadside vegetation, and increase sedimentation into roadside streams and wetlands. 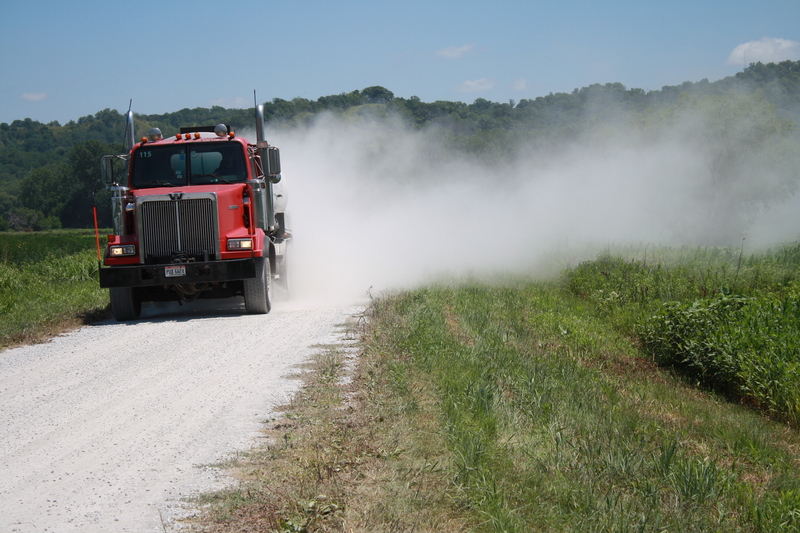 Due to the potential hazards associated with road dust, various dust suppressant chemicals are applied to unpaved roads. In this study, Dr. Kunz and her team determined the toxicity of dust suppressant chemicals to representative aquatic animals and terrestrial plants in a laboratory setting, and also looked at natural communities adjacent to treated road sections in the field. For selected products, the team did not find any adverse effects on aquatic organisms exposed to leachates from treated aggregates in the laboratory or for vegetation adjacent to treated road sections in the field. Results from this assessment support federal agencies and other road managers who must weigh the relative costs and benefits of dust control. Dr. Kunz is a biologist with the Ecology Branch of the U.S. Geological Survey (USGS) Columbia Environmental Research Center. She has worked with many different partners to investigate the effects of contaminants from agricultural, fire-fighting, and transportation activities on natural systems at the laboratory and field level. Her research supports the long-term goals of the Environmental Health Mission Area to provide science needed to understand and minimize risks associated with chemicals used in the management of the Nation's natural resources. This project was a collaboration between the USGS and the U.S. Fish and Wildlife Service. The study was supported through the USGS Contaminant Biology Program, and the Federal Highway Administration's Federal Lands Transportation/Refuge Roads Program and the Public Lands Highway Discretionary Program.